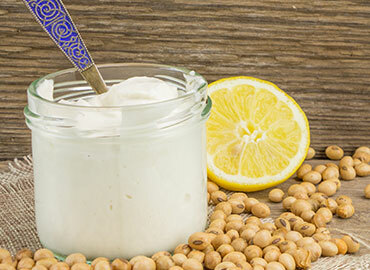 100% mayonnaise free, his versatile concoction is used as a side dish or garnish. Even ardent coleslaw detractors will come to the table for this dish, as this author has. 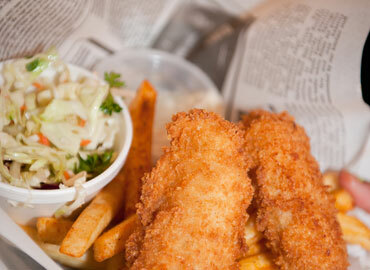 Fish & Chips is our biggest seller to locals and visitors alike. Whether following the recipe exactly or putting your personal spin on it, it's hard to screw up anything battered and deep-fried. 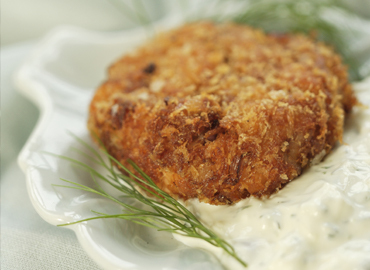 With many Alaskans claiming Scandinavian heritage due to the halibut fishery, salmon fishcakes became a popular home meal. This is our gourmet answer to a Southeast classic. What is a fish restaurant without tartar sauce? Our guests go through this gourmet condiment with a vengeance, as we see it being used on everything from fish to fries. Grilled shrimp with a bit of Tabasco is a treat at the Alaska Fish House. Delicious unseasoned and dipped in melted butter, you'll find Southeast shrimp a simple delicacy. Smoked salmon is the Alaskan version of southern BBQ, with many locals giving it their own special twist. Smoked with alder, this is a fancy version of Alaska's signature dish. 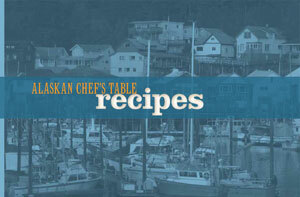 We built the Alaska Fish House to create this dish for our Guided Fishing and Wilderness Dining excursion. Perfect for our local whitefish, this French classic is why we're here. This condiment can almost be used as a stand-alone side. Incorporated in many of our dishes, fennel provides a critical taste profile for many of our dishes. There is an art to making a good fish stock. Without it, many of our dishes would be flavorless. 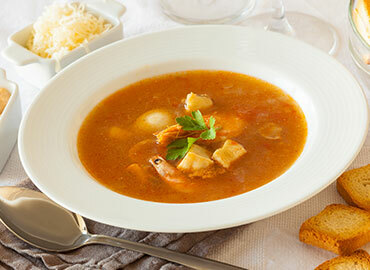 Good stock is the critical foundation to a rich, savory bouillabaisse. Alaska red king crab is one of our most popular items in the AFH. The ginger scallion pesto wonderfully accents the inherent flavors of this Alaskan icon. 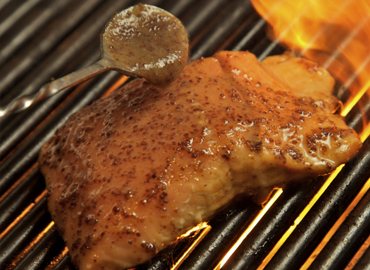 Fresh grilled salmon needs very little in the way of added flavors. Perfect for all five species, this glaze should be used judiciously so you don't overpower the natural flavor. Originating in Europe, this preservation technique yields a popular appetizer with many of the same uses as smoked salmon. Fermented rather than smoked, creating this dish is a rewarding experience. The first time I cooked halibut after moving south, this is the recipe I called my mother for. Simple enough for a college student, this is the taste of home. Fresh fish and fancy bacon, what else do you need to know? Every restaurant has to have their signature dessert. 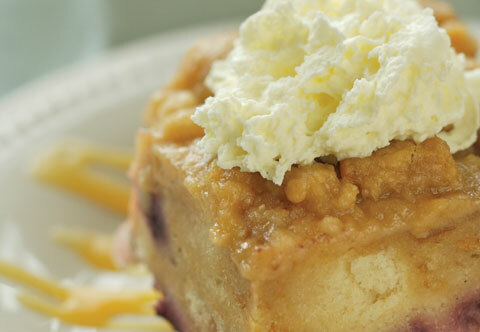 The AFH has rhubarb blueberry bread pudding. The acidity and sweetness of our local rhubarb and blueberry is a popular Southeast combination. In a food processor or blender mix together all dressing ingredients until well blended. Prepare the Dry Mix, and add dressing to your desired consistency immediately before serving. Gently stir together all the salmon mixture ingredients. Then whip them with a blender or whisk until slightly fluffy. Adjust the panko until mixture holds together (not too dry). Shape into patties, at least 1" thick and 1.5" diameter. Refrigerate for at least 1 hour. A deep fryer is best, otherwise, heat frying oil to 350°F in a deep pan. Pour enough oil so it comes halfway up the sides, have tongs and cover ready. Place the flour, beaten egg and panko in three separate plates/bowls. Dip patties in the flour, next the egg mixture, then gently press/roll into panko mixture. Pan fry fishcakes in oil until golden on each side. Drain on paper towels. Keep warm. 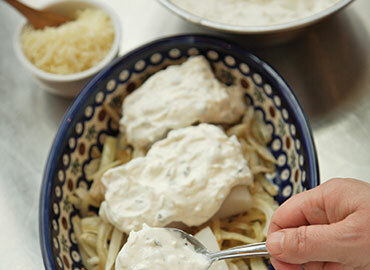 Serve with Fennel Tzatziki sauce and garnish with fennel. These little morsels freeze really well. After breading, simply layer them in a deep pan, separating layers with parchment. Thaw then cook. Mash garlic into a paste, add the soy and lemon juice, mix until smooth. Fold in the mayonnaise and then the green onions. Pre-heat the grill to moderately high heat. In small saucepan, combine the butter with the remaining ¼ cup of hot sauce, other ½ garlic, 2 tsp lemon juice and simmer over moderately low heat for 10 minutes. Remove from heat. 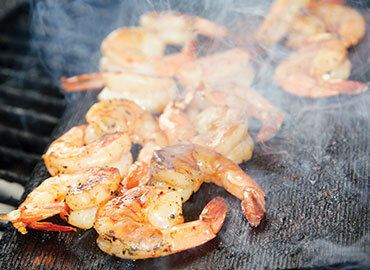 Grill the prawns for 4-6 minutes dependant on size, turning once, until the shells are pink and lightly charred. Toss the prawns in the saucepan with the butter until evenly coated. Move Prawns to serving platter with bowls of blue cheese dressing sprinkled with crumbled Maytag blue cheese. Mix the sour cream and 2 tbsp. Dijon together. Adjust mustardsour cream mixture to taste. Slice the tomato and remove the seeds and center flesh. Dice the red onion and tomato into small bits and stir the capers into the mix. Sprinkle the mixture around the salmon and dollop the sauce on the side, or serve each mixture in a separate bowl. Dissolve all ingredients in hot water; add ice to cool the brine solution before adding fish. Pour into a pan/ bucket that will hold liquid and fi sh. Submerge fish flesh side down & store tightly covered in refrigerator for 12 and up to 24 hours, dependent on thickness. 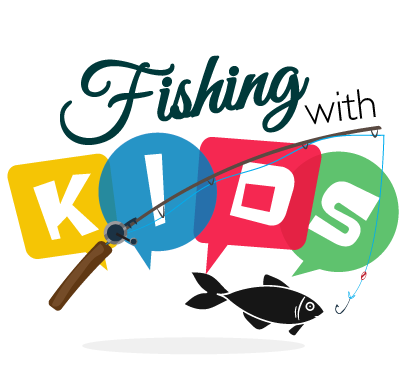 Pull fish from brine and thoroughly rinse and lay on rack to air dry until the fi sh is “pellicle”– the shiny, slightly tacky skin that forms on the surface of fi sh following curing. Use Alderwood or other hardwood chips for smoking. Soak chips at least 24 hours. Place the wet chips in the smoker or in heavy duty foil wrapped in a packet, poked with a few holes for smoking. When salmon is “pellicle,” add fi sh to smoker. Set up your smoker or grill to maintain a temperature to 160 – 200°F. Smoke up to 2 hours, until moist and firm. Heat 3 tablespoons olive oil in a heavy 6-quart stockpot over moderate heat until hot but not smoking. Stirring often, sauté the onions and carrots 3 to 5 minutes until onions just start to turn opaque. 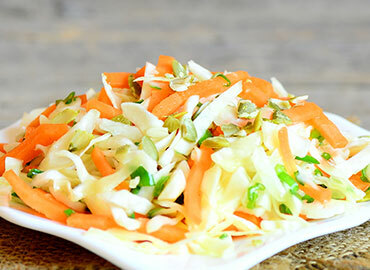 As the onions and carrots sauté, use a pinch of salt and the side of a broad knife to mash the garlic into a paste. Add the garlic to the saucepan and cook 3 minutes. Stir 2 ounces of saffron tea into the vegetables. Add the tomatoes and tomato paste. Cook, stirring, for 4 minutes. Add 1 1/2 cups fi sh stock. Simmer, loosely covered, for 30 minutes or until tomatoes just break. Discard the bay leaves. In a separate non-stick skillet, heat 3 tablespoons olive oil. Add the potatoes. When the potatoes begin to brown, add 2 to 3 ounces of saffron tea. Stir together and continue to sauté until the potatoes have a rich, golden color. Loosely cover and simmer to desired tenderness. Add the remaining saffron tea and simmer until the liquid is evaporated. Line the bottom of 6 bowls with the potatoes. Ladle the tomato mixture over potato. Top with the fish. Ladle fish stock around the sides of the bowl. 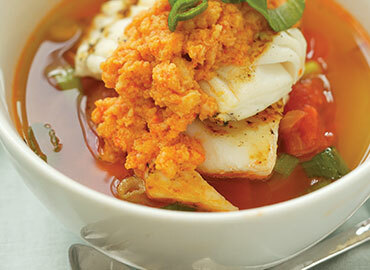 Top the fish with additional rouille and green onion for garnish. Peel and seed the cucumber. Slice the cucumber into 1/8" lengthwise slices. Put the slices in a colander and toss with 1/2 tsp. salt. Press with paper towel and set aside for 2 hours at room temperature to let the water drain. Remove the cucumbers form the colander and gently squeeze them to release any excess water then dice into 1/8" squares. 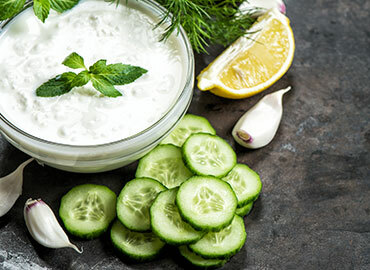 Gently mix cucumbers yogurt, sour cream, fennel, garlic and lemon. Add salt and pepper to taste and serve immediately. Heat the oil in a 12-quart stockpot over medium-low heat until the oil shimmers. Add the celery, leeks, onions, mushrooms, garlic and fish frames. Increase the heat to high, cover and sweat the ingredients, stirring once or twice, until bubbly: about 10 minutes. Lower the heat to medium and continue to sweat about 10 minutes longer, stirring frequently and pressing on the fish frames with a wooden spoon to break them down. The vegetables and bones should be soft and aromatic. Add the wine and bring to a simmer. Reduce the heat to low and simmer, covered, for about 10 minutes, skimming foam from the surface as necessary. Add 2 quarts of water, parsley stems, thyme, peppercorns, bay leaf and salt. Increase the heat to high and bring to a simmer. Reduce the heat to low and simmer, uncovered, about 30 minutes, skimming foam as necessary. The stock will be rich and flavorful. Strain the stock through a chinois or a colander lined with a damp cheesecloth; discard the solids. Refrigerate overnight. Skim the fat off the stock. Can be kept in airtight container for 2 days or frozen for six months. Preheat oven to 325°F. Roast Garlic in olive oil. Combine the garlic, scallion, cilantro or parsley and ginger in a mini processor or blender. Add the oil and white wine and process until it becomes a thick puree. Grab the crab with a towel and use scissors to cut down the white softer side of the shell. Continue to widen the slot to 1/4' to 1/2" providing the perfect bed for the Pesto. 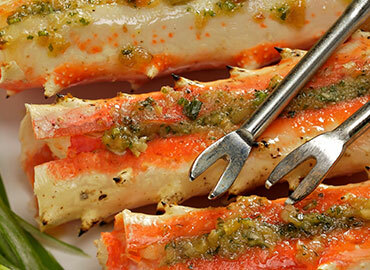 Spoon the pesto over crab legs, spreading it lightly across the meat with the back of a spoon. Lay the crab on a baking sheet and broil until just warm and slightly bubbly, about 5-7 minutes. Fire up grill to medium-hot. Mix butter, honey and mustard well in a small bowl. Lightly coat fillets with salt and pepper for 15 minutes before grilling. Rinse seasoning off fillets and pat dry, lightly coat with olive oil. Place Salmon fillet on grill salmon skin side up for 1-2 minutes. After turning over, top generously with glaze.When fish is cooked to desired doneness, remove fish from grill by shimming a very thin spatula between the fish and its skin. Set the fillet on a platter for serving. Pull pin bones from fillet. In a two inch deep glass or ceramic dish that fits the fish closely, mix salt, sugar, herbs, lemon, and liquor. Spread this mixture evenly over both sides of the fillet. 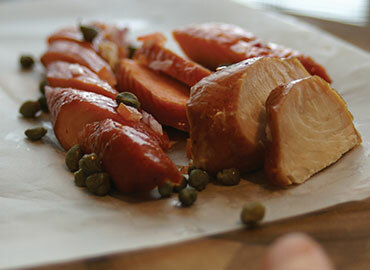 Wrap the coated salmon in plastic cellophane; place in a pan. Take a slightly smaller size pan or similar flat object and place on top of the fish. Weight the top of pan with something heavy to press on the fillet and draw moisture out. Refrigerate for up to 36 hours. The salmon should be firm to the touch at the thickest part of the fillet when fully cured. If, after 24 hours, your salmon is still a little soft, pour the excess juices and brine over the fish, put it back in the refrigerator and check it again in 12 more hours. Repeat process until fish is fully cured. Rinse off any un-dissolved salt or sugar from the salmon to discover the salmon is slightly weathered looking. It should not be shiny, but transformed into a perfectly dense, flavor-packed dish. Slice the salmon at an angle as thinly as possible with a sharp, thin-bladed knife. Don't worry about the skin; it's harder to cut then you'd imagine, so it's easy to just leave it behind intact. 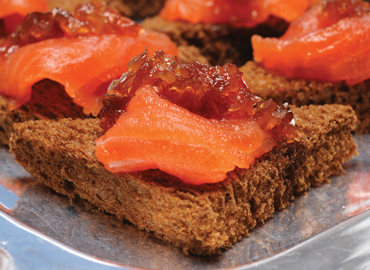 Serve on Rye Toast Points with Sweet Onion Marmalade (See sides and Sauces) Gravlax will last one week in refrigerator, or wrapped tightly in plastic wrap and foil for two months in freezer. Mix all the topping ingredients together in a bowl. Refrigerate until ready to cook. To prepare the braised fennel, cut fronds from fennel and reserve. Trim ends and slice fennel into thin slices about 2" long. Over very low heat, add the olive oil and butter to the saute pan. Once warmed, add the fennel and allow to cook until soft and translucent - about 10-12 minutes. Cut halibut into 4-6 ounce portions and season with salt and pepper. Line bottom of baking pan with sliced braised fennel and drizzle with olive oil and salt & pepper. Add splash of white wine. Place halibut portions on top of fennel and using a spoon, spread Olympia Topping over the halibut, just like icing a cake. Cover the halibut on the top and sides, making sure you cover at least 1/8 to 1/4 inch thick, then top sauce with a little extra cheese. Bake uncovered for approximately 10-15 minutes or until golden brown on top. Gently scoop fennel and halibut on to plate; garnish with fennel fronds. Cut halibut into 3 - 4oz. pieces approximately 3/4-1" thick and pat dry. Lightly season with salt and pepper. Wrap the pieces with pancetta & set aside. In a saucepan over medium high heat reduce Frangelico by half. Stir in heavy cream. Stirring often, lower heat and reduce liquid by half. In a separate pan make the roux by melting the butter over very low heat. Immediately begin stirring in the flour, then add nuts and continue stirring for 5-7 minutes until a light brown. Remove from heat and stir until slightly cooled, to prevent burning. To thicken the Frangelico and cream slowly add the roux until you reach the desired consistency. Set sauce aside over low heat, stirring occasionally. In a large saute pan, heat olive oil on medium heat. 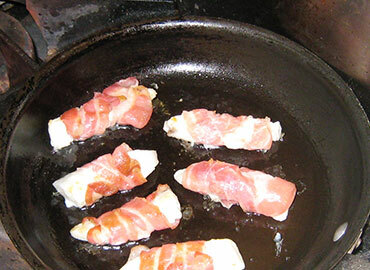 Cook halibut fingers and pancetta on all sides, until thoroughly cooked and pancetta is crispy. In a medium mixing bowl, mix frozen fruit with lemon juice and ginger. In large bowl, mix together brown sugar, cream, milk, vanilla, eggs, cinnamon and allspice. Fold in bread. After all liquid is absorbed, fold in frozen fruit. Put in greased baking pan that can fi t into a water bath. Sprinkle topping over pudding. Bake for 90 minutes at 350 F, test with a knife until it comes out clean, bake up to 30 minutes longer as needed. Mix together melted butter, flour and brown sugar. It will be slightly doughy. Squeeze between fingers to sprinkle on pudding. Do not press down. You will need two pans: the the one holding the recipe and another larger one. The larger pan should be about 2 to 3 inches wider on all sides than the recipe’s pan and at least as high. Make sure to leave at least 1 inch around the bread pudding pan so hot water can circulate.